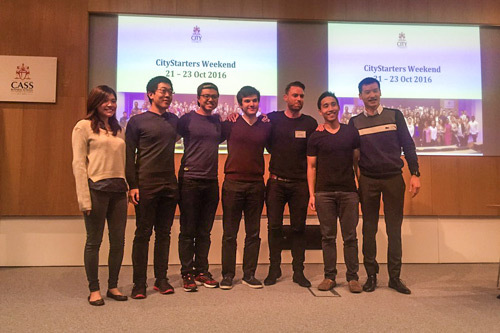 CityGo, a travel essentials kit aimed at tourists and students, was named the winning business idea at the CityStarters weekend. More than 100 students attended the weekend event, where they learnt about starting a business, received coaching and mentoring and pitched their business ideas to judges. During the event the students formed 15 teams, each with a separate business idea that they would work on together over the weekend. In their teams, the students learnt how to create business and marketing plans and then pitch the idea with help from mentors and four visiting entrepreneur speakers. Previous CityStarters winners also returned to speak to the students. I am really excited about the event and how hardworking and entrepreneurial students were throughout the weekend. We heard some brilliant business ideas and I am looking forward to seeing how the teams will progress throughout the year. 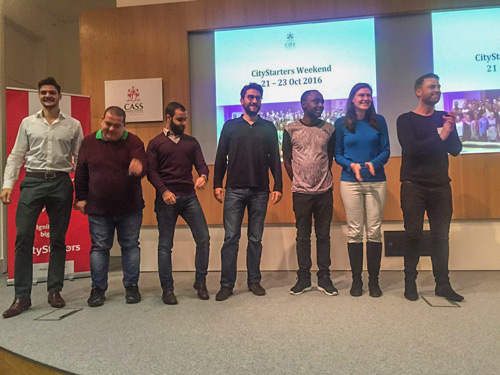 The four winning teams took home cash prizes, sponsored by the Santander Universities fund. Chayo Tantivasin (MSc, Entrepreneurship), Patcharaphol Achariyasilp (MSc, Entrepreneurship), Vadik Kamaryan (MSc, Entrepreneurship), Tsz Wing Liu (MSc, Entrepreneurship), Cheng En Chi (MSc, Management) and Chia Hsiang (MSc, Finance). CityGo addresses the emotional and economic needs of international travellers. It aims to help clients decrease stress and increase productivity by helping them manage their time more effectively. CityGo is a box that includes a prepaid sim card, a travel card and a city guidebook that travellers can order and receive before departing on their trip. I have always wanted to be an entrepreneur. After working on the idea for a few days, I couldn’t stop thinking about it. 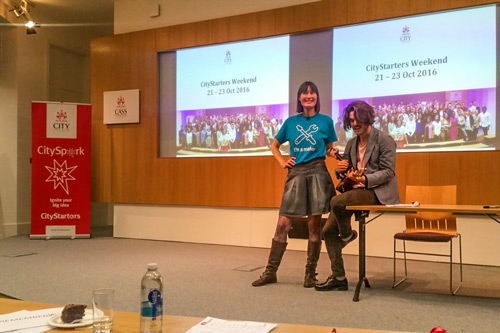 I decided to take part in the CityStarters weekend to meet new people and gain some constructive feedback about the idea from mentors and entrepreneurs. 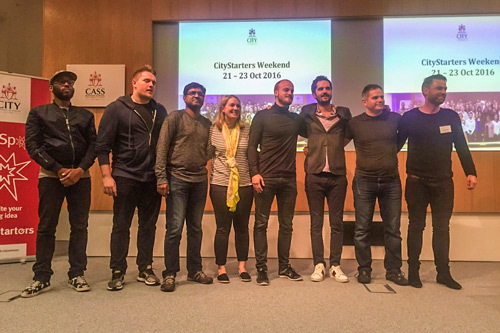 Miguel Ortis-Menendez (MSc, Finance), Dominic Graham (MBA), Prasana Murthi (MBA), Catherine Darlington (MBA), Magnus Bjelland (MSc, Innovation), Aubry Dibas Franck (MSc, Entrepreneurship), Ilya Melkumov (Economy and Accounting). The Oven is a physical street food market with a twist - a place where restaurant startups can prove, refine and scale their concept. Miguel set up a food market in Mexico and came up with the idea for The Oven after noticing the struggle new restauranteurs face when they open a new business. He decided to use the same model, turning it into a learning environment while reducing costs and risk for the startups. Miguel said the CityStarters weekend was a great learning experience. My teammates and I had a great time and we learned a lot from the mentors and from ourselves. Coming from different backgrounds definitely helped us consolidate the idea into a solid business plan. Dana Shapiro (Masters in Creativity, Innovation and Leadership), Wassim Dardari (Masters in Innovation, Creativity and Leadership), George Quentin (Computer Games Technology), Andreas Lake (MBA), Gianmarco Lombardi (MBA) and Tayseer Hadi (Culture Policy and Management). RememberWhen is a place where content creators, for example writers, can connect with people who have stories to tell, to document memories for future generations. Once the two parties have connected via the RememberWhen website, they can get together for the writer to conduct an interview and produce a short story for the individual to share with their families. I loved the weekend. My team was exceptional and we worked together really well. It was great to meet such a diverse group of people, to have the opportunity to work with students from different disciplines across City and to have mentors from a variety of backgrounds with so much experience. The weekend was hugely empowering and made me feel like starting our own business was possible. Edoardo Faini (MSc Entrepreneurship), Umang Shankar (MBA), David Bull (MBA), David Harris (Business Studies). Wooland is a coaching service for local independent artists like musicians, painters and poets. The aim is to help them develop entrepreneurial, managerial and sustainability skills so that they can commercialise their art. Edoardo Faini came up with the idea because he wanted to use his business management skills to help new artists. I really enjoyed the weekend as a whole and I learned lots. Firstly, I learnt that the process of creating a startup is truly fun – it’s what I see myself doing in the future. Winning a prize and talking to entrepreneurs convinced me that I have the potential and capability to make a business a success.